The Best Location on the Beach, Close to All the Action! Oceanfront Getaway has it all for the best beach vacation imaginable. This one bedroom condo is located oceanfront with spectacular ocean views right on the Hollywood Boardwalk. This condo is literally steps from the Oceanfront pool and direct beach access. A better location never existed right in the heart of the action near Margaritaville and the new state of the art playground on the beach. 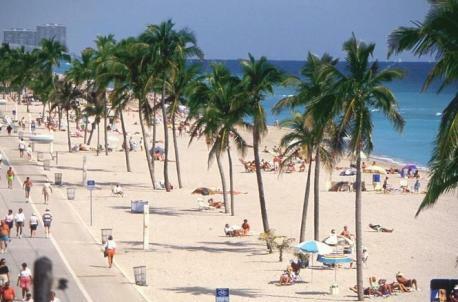 Stroll the Boardwalk's restaurants, shops and pubs, this is the ultimate Hollywood Beach Lifestyle. Queen size bed in the master with 2 futons in the living room, Pac and Play and Airbeds available on request. We have everything you need for 4+ guests, including towels, beach towels, sheets, beach chairs and beach umbrella. There are Pac n Plays and airbeds available upon request at no charge. Located on the ocean just steps from the Caribbean style beach with miles of wide white sandy beaches and turquoise waters. This property is professionally managed by a team available 24 hours a day, 7 days a week to take care of your every need. This home has it all at a great introductory rate for all of your vacation needs.